A shocker of a day migrant-wise, with the total of just one summer visitor trapped and ringed all day at the Obs adequately reflecting the dearth of birds everywhere, both on the ground and overhead. What few morsels of interest there were included 8 Whimbrel and singles of Hobby and Yellow Wagtail at the Bill, a Ring Ouzel at Coombefield Quarry and 4 Sanderling and a Knot at Ferrybridge. The sea was no better, with 2 Great Northern Divers, 2 Arctic Skuas, a Red-throated Diver and a Great Skua the best of what little there was on the move off the Bill. A single Pearly Underwing was the only immigrant moth caught overnight at the Obs. Just as a quick snapshot of how the spring's going we've collated the April ringing figures at the Obs which are well on par with most recent years. 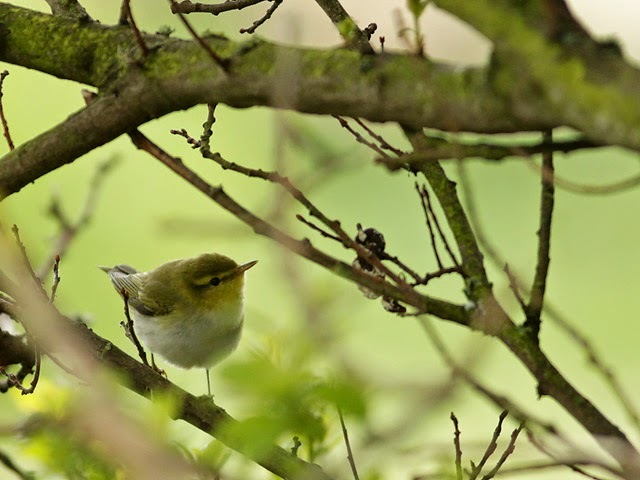 The month total of 1657 birds was dominated by the usual suspects: Willow Warblers made up 51% of the total, with the combined Willow Warbler, Chiffchaff and Blackcap total constituting no less than 84% of the total; among the also-rans, Redstart fared well with a tally of 43, but taken together just 7% of the overall total consisted of other trans-Saharan migrants. We usually do much better for these other species during May so with any luck there's plenty of action still to come. 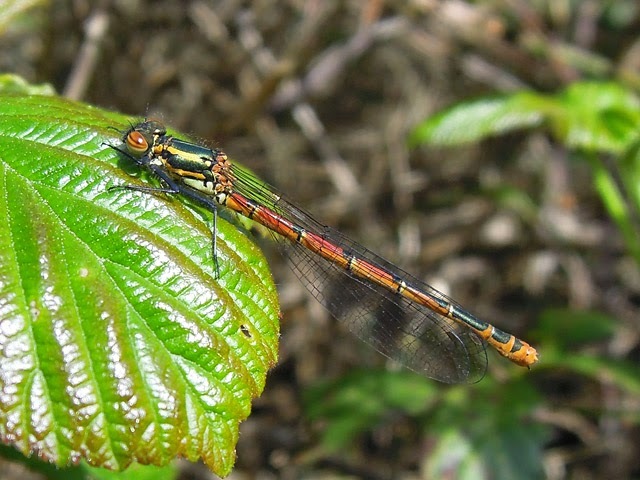 We're not sure we've ever featured Large Red Damselfly on the site before. These days it's a common enough inhabitant of the ponds in the Obs garden although we're not sure of the origins of the population there which wasn't noticed until relatively recently; perhaps most likely they were introduced - by accident or design - but it doesn't seem to be recorded whether or not the species was present elsewhere on the island before this event (no Portland records are given in The Dragonflies of Dorset 1991). The Bullfinch was on interest - quite apart from the fact that, at least at this moment, it was considerably more visible than they usually are at the Bill - since in the hand it was discovered to be an individual ringed at the Obs last December but no seen there again until today; we usually assume that most Bullfinches straying out to the Obs are of slightly more distant origin than Portland itself (there is a small resident population centred on the Verne Common area) - and there is some ringing evidence to back up that supposition - but clearly that isn't always the case. 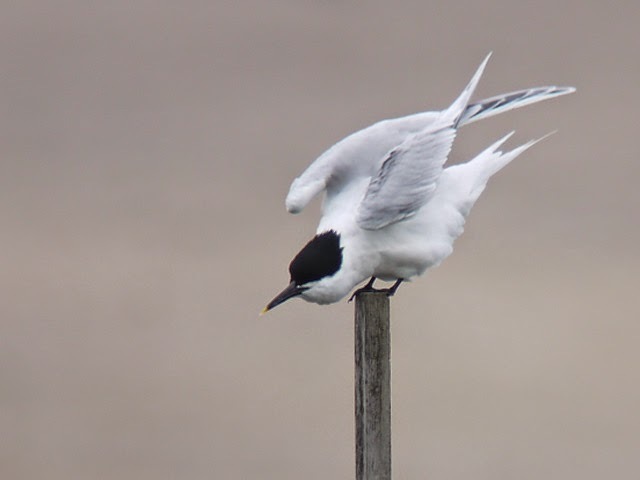 Yesterday's low numbers were maintained, with a couple of spells of rain through the morning and a freshening westerly wind clearly not to the liking of migrants on land, overhead or on the sea. 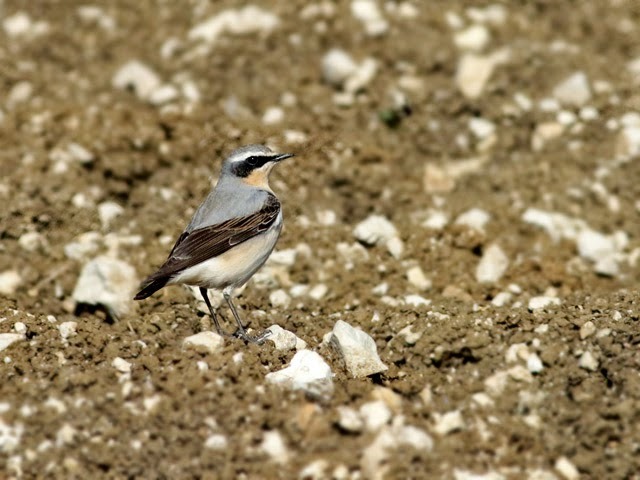 Passerines were certainly thin on the ground at the Bill, where 2 Redstarts, a Sedge Warbler and a Lesser Whitethroat (as well as the long-staying singles of Firecrest and Bullfinch) provided some interest amongst the thin spread of Wheatears and Willow Warblers; visible passage there consisted of no more than a light trickle of Swallows. 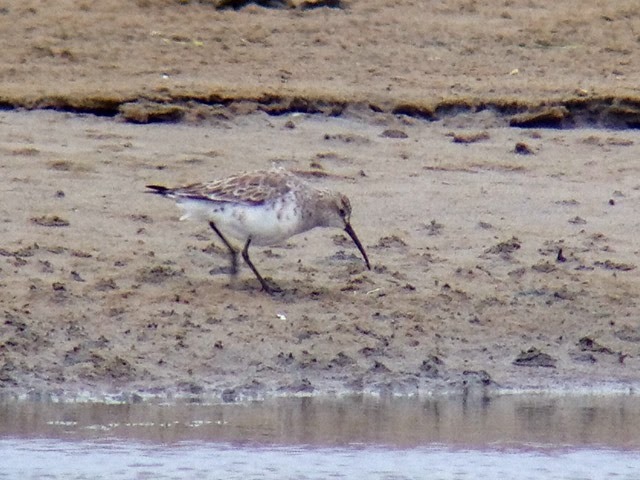 Waders fared little better with 5 Whimbrel at the Bill and 5 Sanderling and a Knot at Ferrybridge the best on offer. The generally more inclement conditions stirred up a good few Manx Shearwaters, with over 1000 through off the Bill, and were no doubt a factor in the appearance of 16 Pale-bellied Brent Geese and 2 Arctic Terns passing through at Ferrybridge, but there were few other rewards from seawatching at the Bill, where a list of 3 Arctic Skuas and 2 each of Red-throated Diver, Great Northern Diver and Great Skua was a poor return from a lot of effort. Immigrant moths consisted of just 3 Dark Sword Grass from the Obs traps. An overnight switch to our least favourite wind direction - north-westerly - put the mockers on things today and it was much quieter everywhere. Wheatear and Willow Warbler were the only two common migrants that managed to get a fair way into double figures at the Bill, where the bitsy back-up list included ones and twos of Yellow Wagtail, Tree Pipit, Redstart and Pied Flycatcher; elsewhere, the Curlew Sandpiper remained at Ferrybridge, where 2 Sanderling and singles of Little Ringed Plover and Knot were amongst the growing wader tally, 3 Common Sandpipers were at Church Ope Cove and a Spotted Flycatcher pitched up at Avalanche Road. The lack of skuas in particular was the source of more anguish for the seawatchers - their tally at the Bill today was just 2 each of Arctic and Great Skua - but a total of approaching 1000 Manx Shearwaters through off the Bill did provide some small compensation. Immigrant lepidoptera consisted of just 4 Dark Sword Grass in the Obs moth-traps and a handful of Painted Ladys at the Bill. Quite an odd day with a decent enough arrival at the Bill, where a steady stream of birds were dropped from a crystal clear sky by the strength of the chilly north-easterly, but few reports of any quantity of migrants anywhere else. Sad to relate that these days the Turtle Dove at the Bill - most likely a lingerer from the weekend - merited top spot in the scarcity stakes, but a Curlew Sandpiper at Ferrybridge was a particularly good spring record, whilst yet further singles of Firecrest and Ring Ouzel showed up at the Bill and Verne Common respectively. 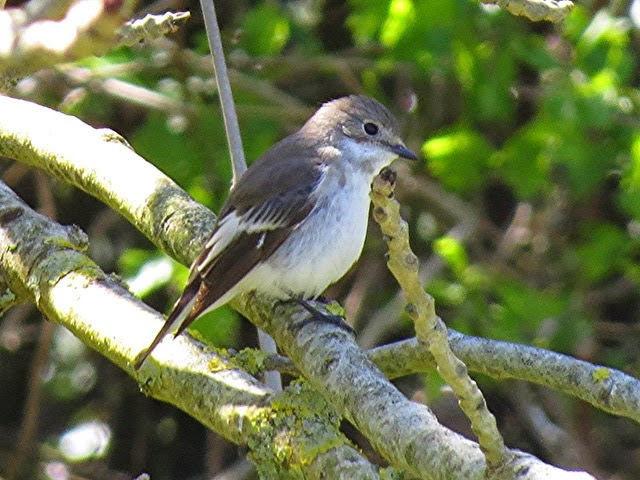 At the Bill, numbers included 200 Willow Warblers, 40 Blackcaps and 20 Redstarts, with lower totals of many of the other expected migrants; a single Pied Flycatcher there and another at Blacknor were the best of the second tier oddities. The sea showed precious few signs of livening up, with singles of Red-throated Diver and Arctic Skua the highlights from an otherwise very mundane list from the Bill. 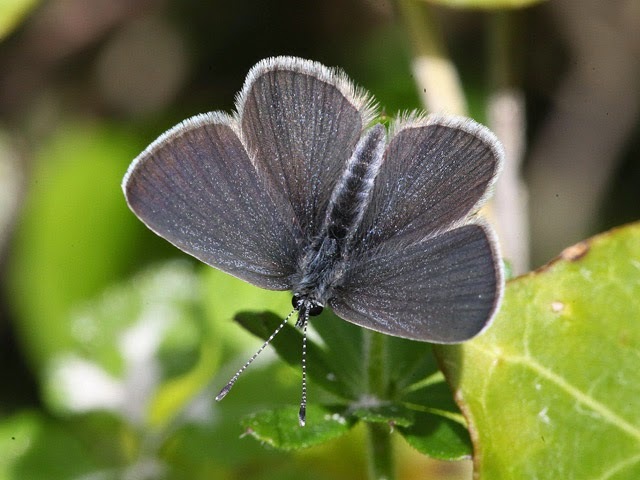 The drop in temperature overnight and the chilly wind by day restricted immigrant lepidoptera interest to a handful of Diamond-back Moth, Dark Sword Grass and Silver Y in the moth-traps and a few Painted Ladys on the wing during the day. Enjoyable birding today with a steady arrival of migrants amongst which variety was a notable feature. 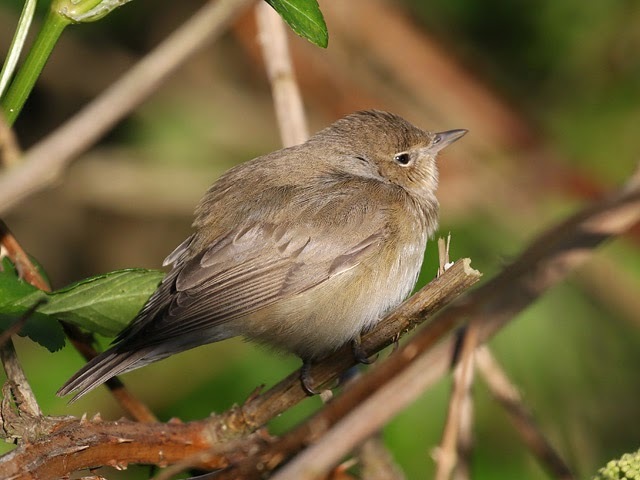 Rarities are not figuring at all at the moment but at a local level a Treecreeper that showed up behind the former Weston Craft Centre was a quality oddity and the first reported from the island this year. Migrant-wise, the day's numbers at the Bill included 100 Willow Warblers, 60 Blackcaps, 30 Garden Warblers and 15 Sedge Warblers, whilst amongst the very full back-up list 2 Grasshopper Warblers and singles of Cuckoo, Turtle Dove, Fieldfare, Pied Flycatcher and the long-staying Bullfinch were nice bonuses; uncommon migrants reported elsewhere included 3 Pied Flycatchers and a Wood Warbler at the Craft Centre and a White Wagtail at Ferrybridge. 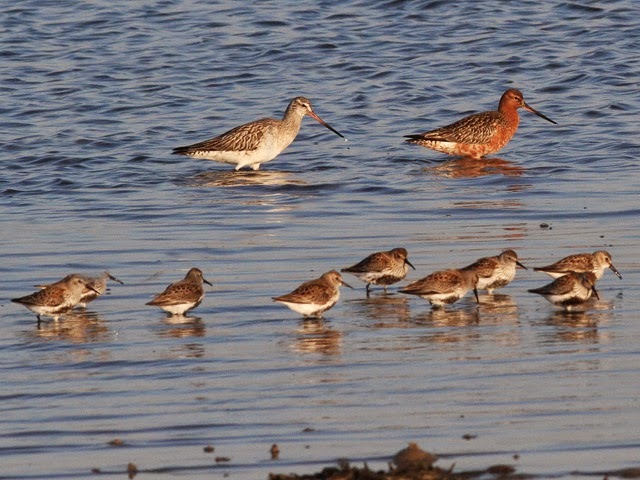 Waders also continued to increase, with 140 Dunlin, 65 passing Whimbrel and a Knot at Ferrybridge. For the most part the sea was still quiet, with single Arctic and Great Skuas the best off the Bill; 15 migrant Little Terns over Ferrybridge were also noteworthy. Immigrant lepidoptera featured again, with single figure totals of Diamond-back Moth, Dark Sword Grass and Silver Y caught overnight in moth-traps throughout the island and, despite the mainly dreary conditions, Painted Ladys on the wing at several sites during the day. 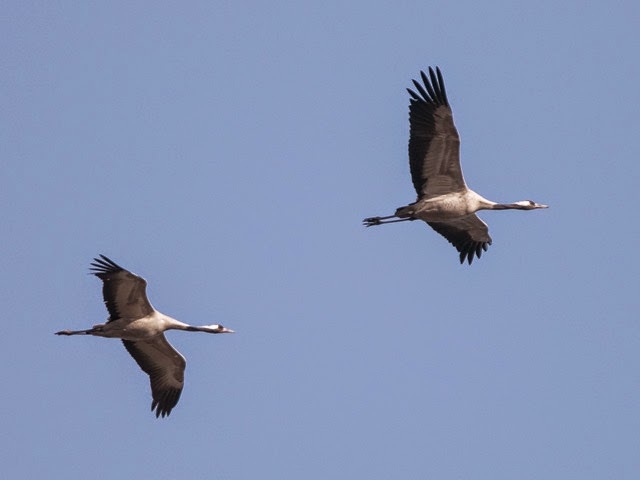 Not the sort that day that had been hoped for with the break down in the weather producing no surprises at all and considerably fewer migrants than we'd got used to through the week. 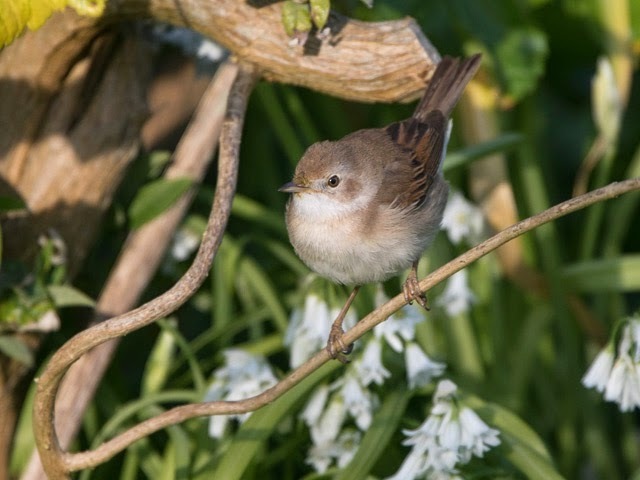 What small arrival there was consisted largely of a sprinkle of Willow Warblers and Blackcaps, together with ones and twos of a fair range of typical fare amongst which singles of Turtle Dove and Grasshopper Warbler at the Bill were about the best on offer. 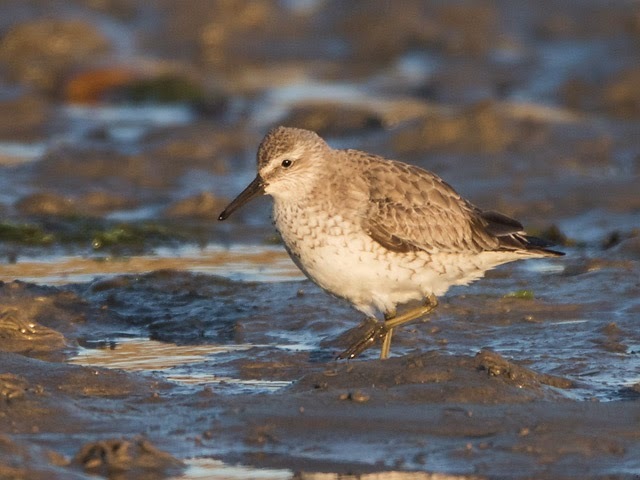 Wader numbers did receive quite a boost, with the 56 Dunlin, 12 Ringed Plover, 4 Whimbrel and 3 Sanderling at Ferrybridge hopefully the beginning of the build-up toward the customary May rush. 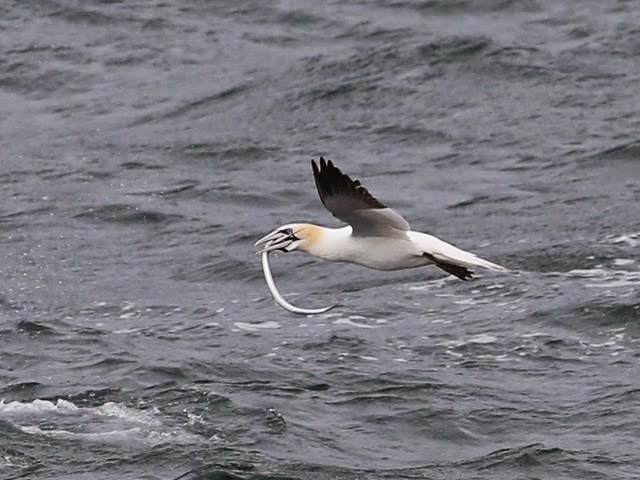 Rewards were still hard to come by on the sea, with passing waders and terns in conspicuously short supply; 100 Manx Shearwaters, 8 Great Skuas, 3 Arctic Skuas and singles of Red-throated Diver, Black-throated Diver and Great Northern Diver provided the best of the interest at the Bill. 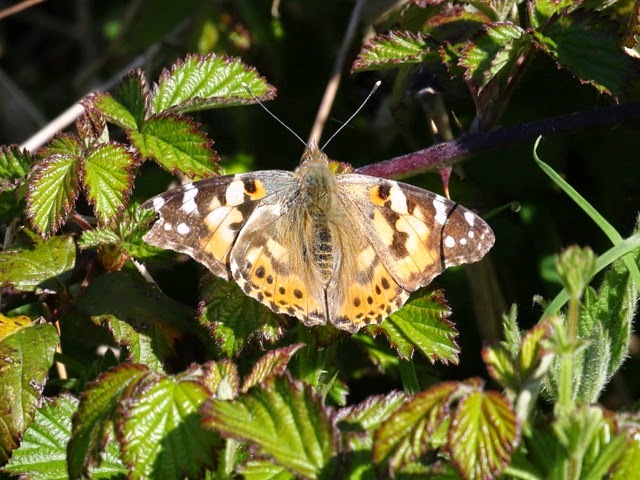 An arrival of immigrant lepidoptera seems to be gathering pace, with 5 Silver Ys caught overnight at the Obs and the Grove, and at least 6 Painted Ladys and several Red Admirals and Clouded Yellows by day at sites throughout the island. Despite there being plenty enough by way of migrants to entertain today's visitors there was a feeling that events didn't quite live up to expectations, after the wind had swung into the west, a decent cloud cover had rolled in and - although it didn't arrive until late in the day - there was the proper dose of rain for several weeks. The day's oddities weren't discovered until the afternoon, when an Osprey headed north over Easton and singles of Turtle Dove and Wood Warbler - both first records for the year - showed up at the Bill. With Willow Warbler up around the 120 mark and both Blackcap and Chiffchaff reaching getting on for half that total, there were plenty of new arrivals to get amongst at dawn at the Bill. 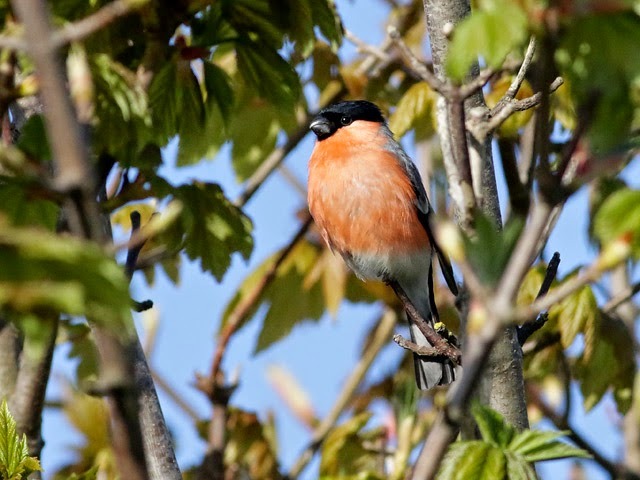 Sadly, it was the back-up cast that was a let-down, with a fair bit of variety but no great numbers; a Ring Ouzel at Verne Common and the long-staying singles of Firecrest and Bullfinch at the Bill were the best of the mainly single figure totals of many of the other expected late April migrants. The sea again struggled to make an impression, with 2 Red-throated Divers and singles of Arctic Skua and Great Skua easily the best of a thin selection off the Bill. 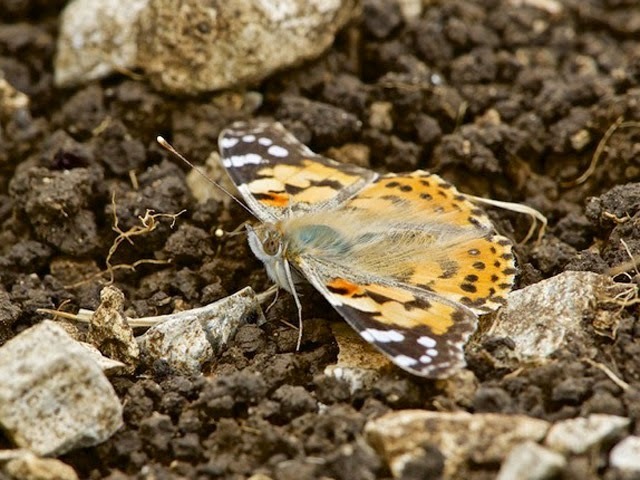 A Painted Lady at the Bill was maybe the harbinger of some lepidoptera immigration reported to be heading our way. 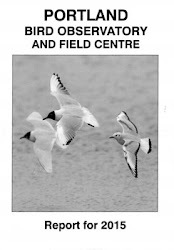 A reminder that the next In Focus field event at the Obs takes place between 10am and 4pm this Saturday, 25th April 2015. A veil of heavy cloud that rolled in from the east overnight was something of a novelty after the recent spell of almost unbroken sunshine and it did no harm to the quality of birding, with migrants once again in good supply between at least the Bill and Blacknor (coverage elsewhere was decidedly patchy). 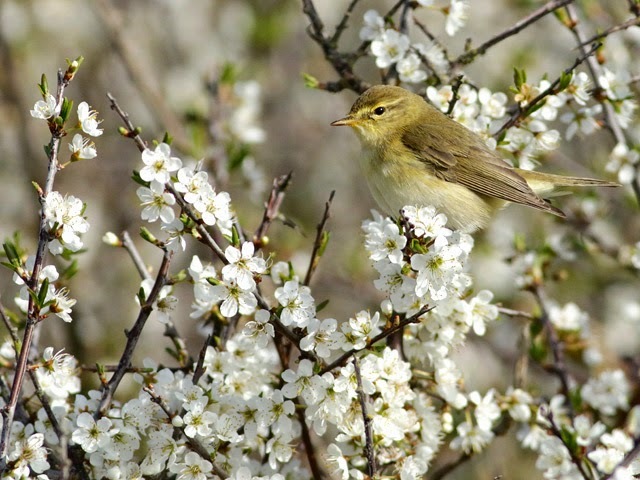 Although Willow Warbler remained numerically top of the list - including 200 at the Bill - variety's increasing by the day as we get well into the second half of spring, and the larger warblers in particular are making up an increasing proportion of each day's tally. The day's varied list from the Bill area also included 50 each of Blackcap and Chiffchaff, 40 Whitethroats, 25 Wheatears, 20 each of Redstart and Garden Warbler, 15 Whinchats, 6 Yellow Wagtails and ones and twos of Black Redstart, Ring Ouzel, Reed Warbler, Sedge Warbler, Lesser Whitethroat, Goldcrest and Spotted Flycatcher; amongst similar totals at up-island sites a White Wagtail at Reap Lane, a Hobby at Blacknor and a Ring Ouzel at Verne Common were of particular note. 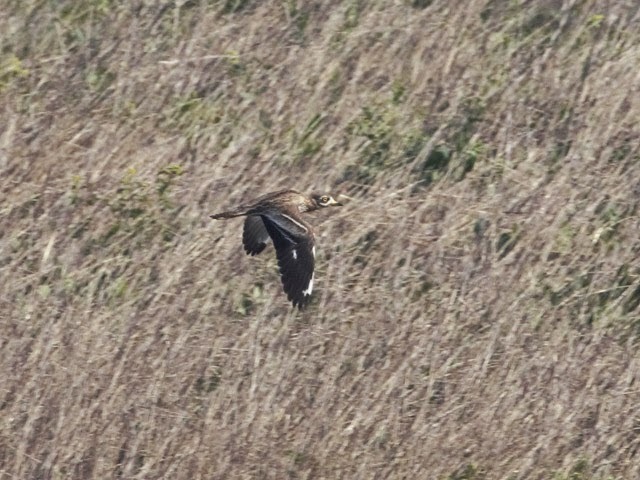 The continuing easterly wind saw to it that Chesil was the favoured seawatch venue, with 170 commic terns, 109 Whimbrel, 3 Arctic Skuas and singles of Black-throated Diver, Great Skua and Little Gull the highlights from watches at either end of the day; much lower numbers at the Bill included another Arctic Skua. 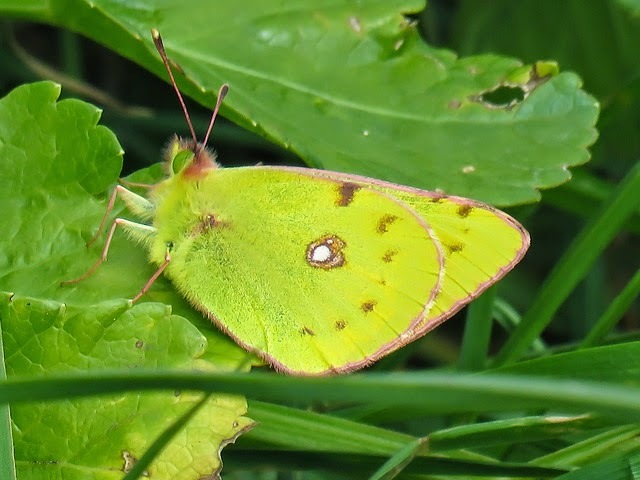 Two Clouded Yellows were at the Bill in the afternoon. Today's wall to wall sunshine rather belied the unpleasant reality of being out for long in the relentless stiff easterly that was still surprisingly chilly - conditions that again led to a decent arrival of routine migrants; numbers and variety fell well short of yesterday's pinnacle but there was still plenty to be seen by those out battling the wind. 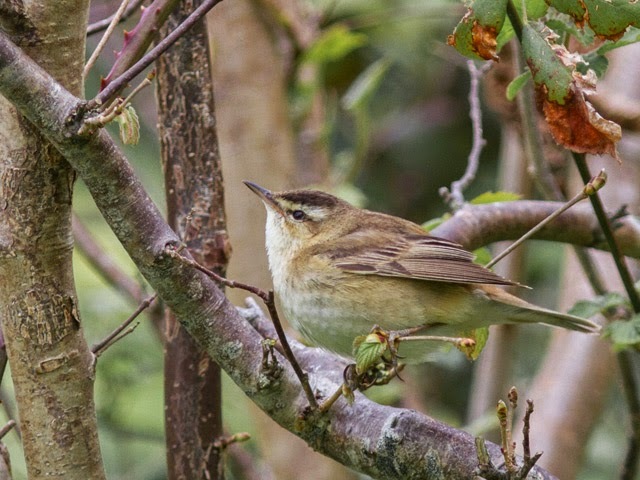 It goes without saying that Willow Warbler remained top of the pile in terms of numbers on the ground, including more than 150 at the Bill, and hirundines featured in quantity overhead all day. 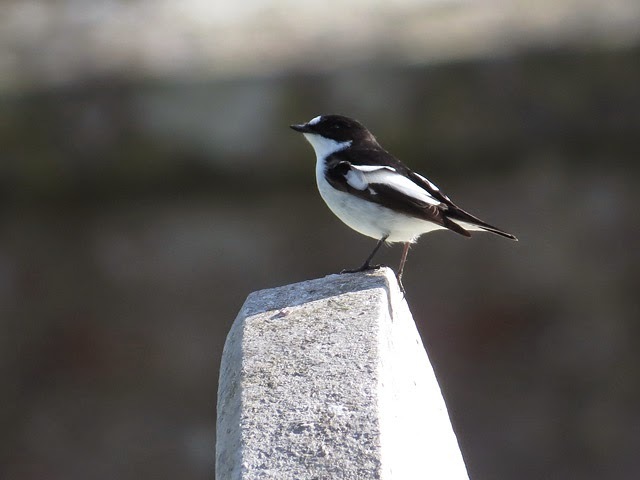 Pick of the variety - again mainly from the western side of the island - included Yellow Wagtail, Redstart and Whinchat on a dozen each, together with 2 Ring Ouzels and singles of Hobby, Cuckoo, White Wagtail, Grasshopper Warbler, Firecrest, Pied Flycatcher and Bullfinch. The sea showed glimpses of promise, particularly during the evening when 45 Bar-tailed Godwits, 6 Arctic Skuas and 5 Grey Plover passed Chesil, but a fair bit of attention earlier in the day didn't return much more than singles of Red-throated Diver and Arctic Skua off the Bill and a few waders, including a Greenshank, off Chesil. A cracking, migrant-filled day enjoyed in constant glorious sunshine. Numbers on the ground maybe didn't quite match one or two of the earlier falls this spring, but variety was easily the best it's been and visible passage overhead was always conspicuous - with birds constantly on the move northward as they made the most of the perfect conditions, the west side of the island from the Bill to Chesil had something of the feel of a conveyor belt of migration action. Censusing was very difficult with so much movement afoot, but we had the feel that 500 Willow Warblers at the Bill alone would likely be a quite conservative estimate; with so much to see on the ground visible passage was seriously neglected, but hirundines were certainly in the high hundreds per hour for a good part of the day. Although a pretty full suite of expected fare made the list, other notable totals and oddities from this passage corridor included 45 Redstarts, 20 Whinchats, 15 Yellow Wagtails, 6 Pied Flycatchers, 2 each of White Wagtail, Ring Ouzel, Firecrest, Spotted Flycatcher and singles of Little Egret, Hobby, Little Ringed Plover, Lapwing, Greenshank, Redshank, Black Redstart and Bullfinch. The sea again promised more than it delivered, with 3 Great Skuas, 2 Black Terns and singles of Arctic Skua and Pomarine Skua off the Bill and 2 Shoveler and singles of Gadwall, Great Skua, Arctic Skua and Pomarine Skua off Chesil easily the best of the bunch amongst the lowish totals of Common Scoter, waders and terns. Another single Clouded Yellow was at the Bill. A second island record of Brindled Beauty at Sweethill was the highlight from overnight mothing; 2 Dark Sword Grass at the Obs were the only immigrants recorded. 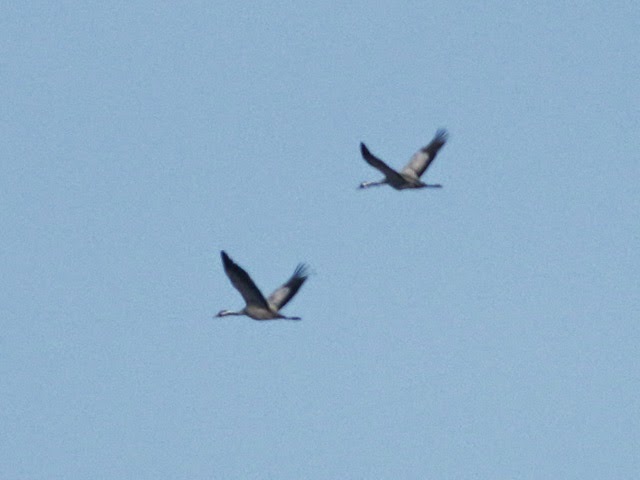 A right old miscellany of sightings in today's continuing glorious weather, notable amongst which were 2 Common Cranes that did a Ferrybridge to the Bill and back again fly-round of the island in the evening and seawatch singles of Avocet and Black Tern off Chesil and Goosander off the Bill. The grounded migrant situation wasn't expected to improve given the cloudless conditions, but in the event there was probably enough of a headwind to encourage birds to drop, even if only briefly; Willow Warbler retained a commanding lead in the numbers stakes, with perhaps as many as 200 through at the Bill alone, whilst less frequent migrants around the centre and south of the island included 8 Redstarts, 7 Whinchats, 3 Ring Ouzels, 2 Firecrests, a Black Redstart, a Pied Flycatcher and a Bullfinch. Visible passage of hirundines in particular was very conspicuous, with 800 per hour through along West Cliffs during the late afternoon; several more Yellow Wagtails and a Merlin were among the other movers during the day at the Bill. Bar the highlights mentioned already, sea passage was for the most part very slow although there were promising signs during the evening of Bar-tailed Godwits beginning to feature, with 50 through over Chesil (in addition to the 11 there during the morning); 2 each of Arctic Skua and Little Gull were also of note at Chesil. Two Clouded Yellows and several Red Admirals were at the Bill, where the first Green-veined Whites of the year were also on the wing. 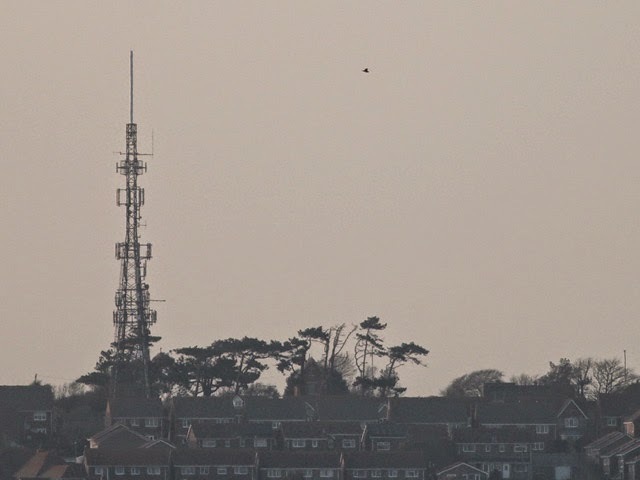 The top image is of a party of Bar-tailed Godwits passing Wyke Church and the second of an Arctic Skua passing the communication mast at the top of Wyke Regis. 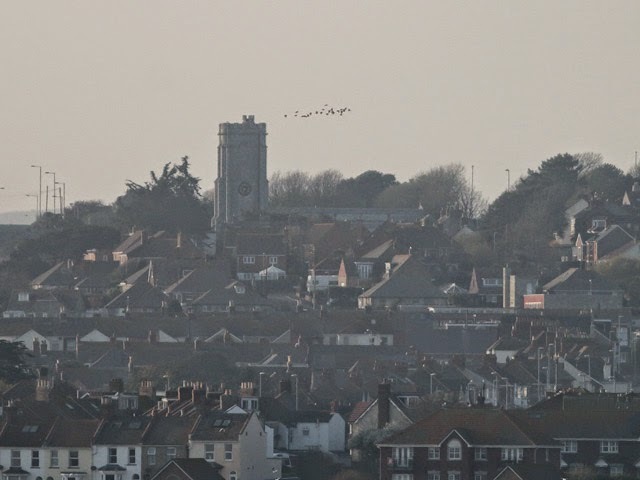 This evening we were watching from the 'Checkpoint' halfway between Chesil Cove and Ferrybridge so the little specks that are the birds in these photos were a mile and a half or more from our viewpoint. Pretty well everything we saw through the evening didn't bother with going round the Bill but came straight at us from the middle of Lyme Bay, veered off west for a mile or so and then towered up hundreds of metres before crossing Chesil and Wyke Regis at great speed before dropping down into Weymouth Bay. Another day of brisk easterlies and clear skies - conditions that really aren't dropping migrants in any great numbers but no doubt helped along the day's new rarity - a Red-rumped Swallow that headed through along East Cliffs at the Bill during the morning; the Hoopoe was also still about at Suckthumb Quarry, but a definitive identification couldn't be secured on the day's other oddity - a ringtail harrier that arrived in off the sea at the Bill. Grounded migrants were a little more numerous than they'd been yesterday, with Willow Warblers still far outnumbering everything else (and including 60 at the Bill) and less frequent fare coming in the form of a scatter of Redstarts and singles of Common Sandpiper, Black Redstart, Reed Warbler, Garden Warbler, Firecrest, Pied Flycatcher and Bullfinch. Greater numbers overhead included at least 5 Yellow Wagtails amongst the steady passage of hirundines, Meadow Pipits and finches. Sea passage was again dreadful, with a lone Great Skua the best of a very bad job at the Bill. Single Diamond-back Moths at the Obs and the Grove were the only immigrant moths caught overnight. And another night sounds update: Nick Hopper's been working through the rest of the sound files from his three nights at the Obs last week and one of the migrants logged is a passing Golden Plover; that in itself isn't too unusual but for novelty value this individual breaks into one of its song-types that's given quite frequently on migration - although presumably not very often whilst flying over at night. For added interest, both Barn Owl and Little Owl start calling in the foreground a little way into the recording. A howling easterly gale really wasn't what we wanted to be greeted with at dawn and it was very quickly apparent there'd been almost no arrival of grounded migrants and - quite surprisingly - extremely little was moving at sea. 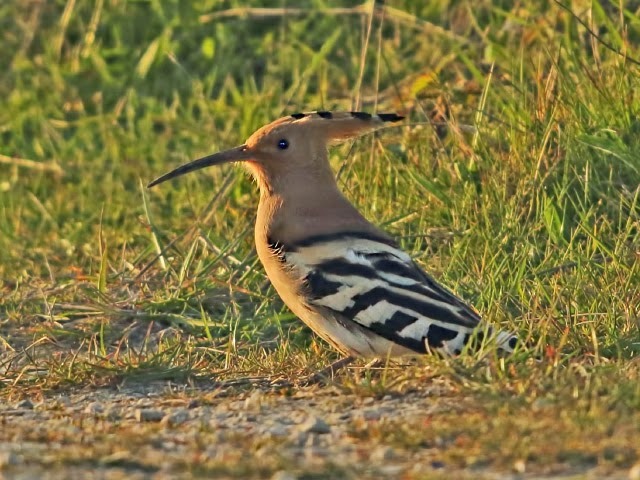 The lingering Hoopoe at Suckthumb Quarry did at least provide some rarity interest for weekend visitors, but over and above that it was hard to find anything worth reporting on the ground bar the long-staying Firecrest still at the Obs; visible passage did get going, and for a time hirundines were whipping through along West Cliffs at a rate of around 600/hour. The sea was the day's big disappointment, with 8 Whimbrel, a Grey Plover and a Greenshank off Chesil and a Red-throated Diver off the Bill by far the best of some unproductive watching at the two sites. 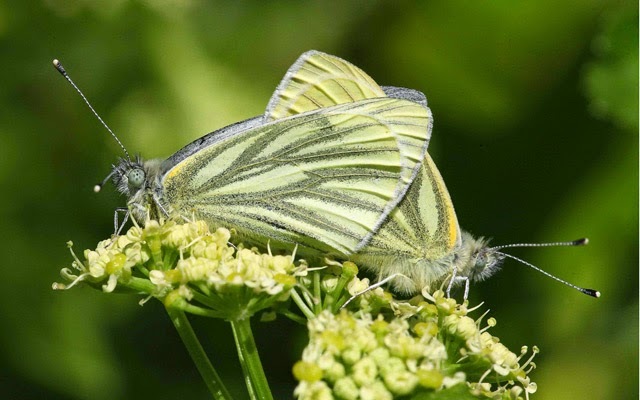 The year's first Large White was at Blacknor. 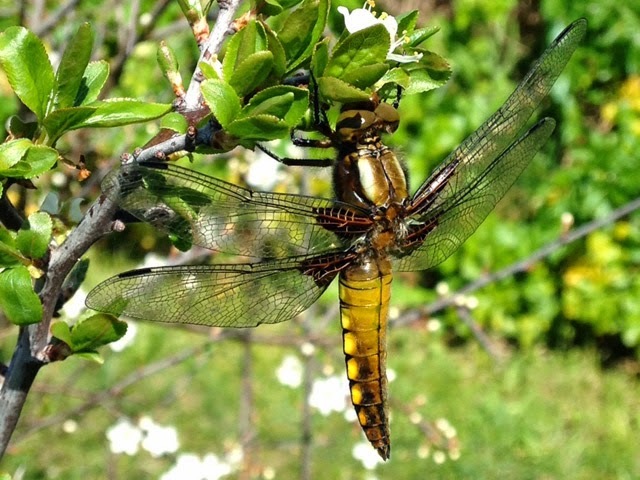 The first dragonfly of the year - a Broad-bodied Chaser - was on the wing at the Obs. Immigrant moths consisted of just singles of Dark Sword Grass and Silver Y at the Obs and a Diamond-back Moth at the Grove. Despite a spasmodic cloud cover there were not the numbers of yesterday - although any 2 Hoopoe day shouldn't be sniffed at. 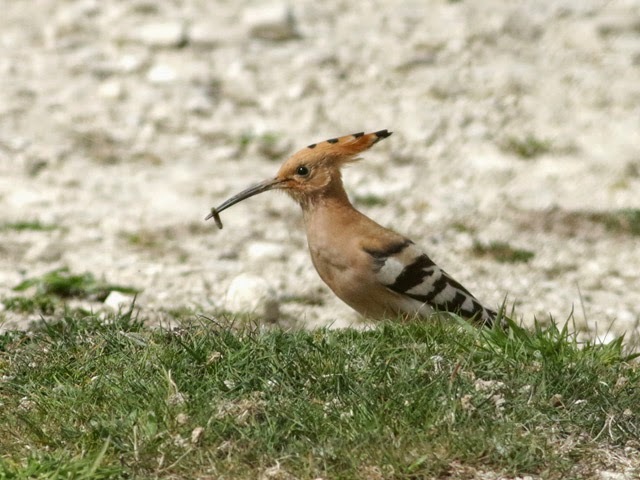 The Hoopoes - yesterday's bird remained at Suckthumb Quarry and a new individual showed up at Tout Quarry - provided the best of the quality, but 2 Red Kites that appeared over the West Cliffs were a nice bonus and single Ring Ouzels at Broadcroft and West Cliffs were, as ever, very welcome. The day's common migrant tally again consisted predominantly of Willow Warblers, with 130 or so at the Bill alone; among the not particularly numerous other arrivals 2 Redstarts and singles of Common Sandpiper, Grasshopper Warbler, Garden Warbler and a Bullfinch were of note at the Bill, where a Firecrest retrapped at the Obs was found to be an individual present since 10th March (what was presumably this bird was even heard in song a couple of days ago) and a Red-legged Partridge was knocking about; singles of Lesser Whitethroat (the first of the spring) and Pied Flycatcher at Avalanche Road/Suckthumb were the best elsewhere. Swallows in particular were on the move overhead in good numbers at times but visible passage was otherwise not the feature that might have been hoped. The sea got plenty of attention but produced few rewards, with 100 Manx Shearwaters, a Black-throated Diver and a Great Skua off Chesil, and 54 Common Scoter and a Red-throated Diver off the Bill the pick of a poor return. 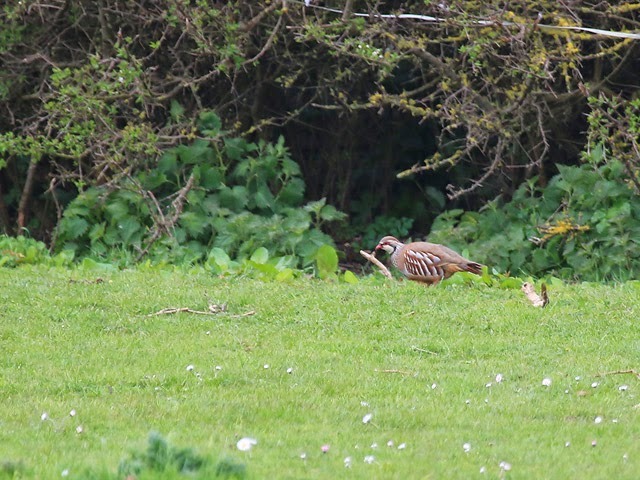 ...the menagerie of game-birds grows; we hadn't mentioned a couple of sightings of Red-legged Partridges in recent days - perhaps in the hope that they might go away! - and we'll see whether more get released. 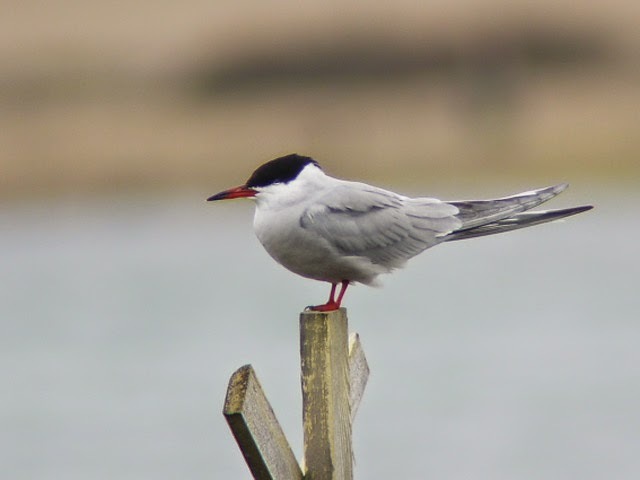 A stiffer north-easterly did the trick today and although the skies were still mainly clear there was big improvement in migrant numbers and variety. 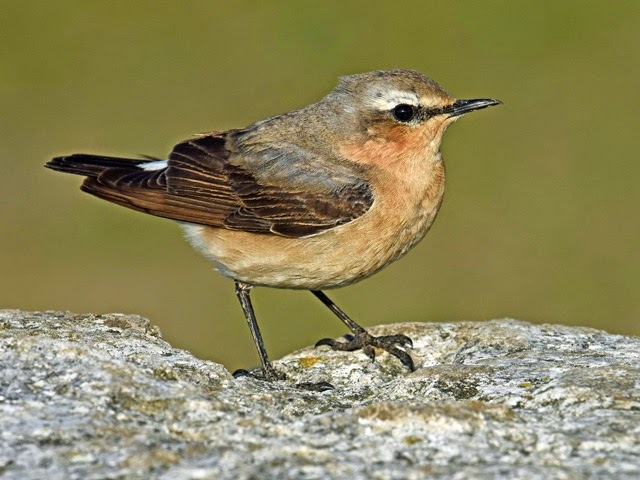 A Hoopoe that showed up at Suckthumb Quarry stole the show rarity-wise, whilst a Garganey through off the Bill, a Garden Warbler at Southwell, a Swift over Blacknor, a scatter of at least 4 Whinchats and an Arctic Tern in Portland Harbour were all also additions to the year-list. 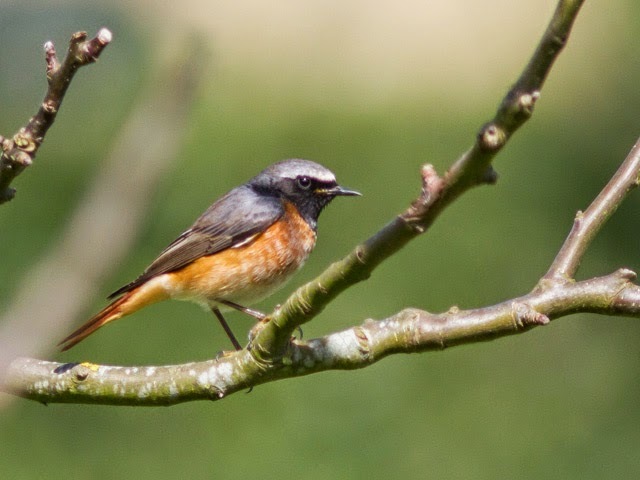 Migrants were surprisingly patchily distributed, with hot-spots such as the Obs garden/hut fields area very busy with activity but other areas almost devoid of interest; in the Bill/Southwell area Willow Warblers were overwhelmingly dominant and numbered a good 300, but most other expected species put in appearances with 10 Redstarts and 2 Firecrests (1 a newcomer) of particular note; elsewhere, a Brambling at Perryfields was a nice late record. 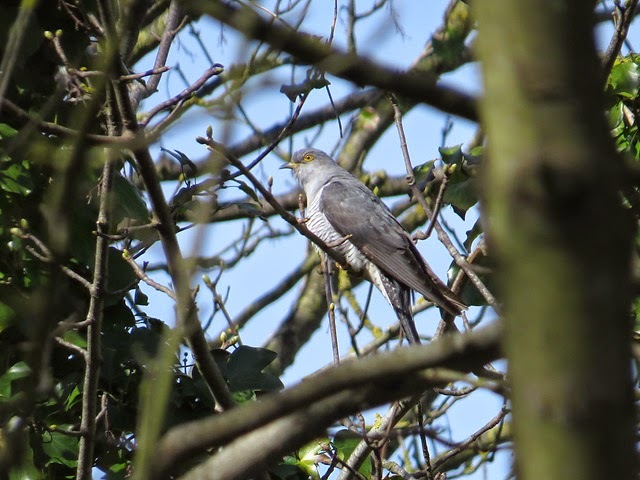 It was also conspicuously busier overhead everywhere, with House Martins outnumbering Swallows at times, and a Merlin and half a dozen each of Yellow Wagtail and Tree Pipit of interest at the Bill. 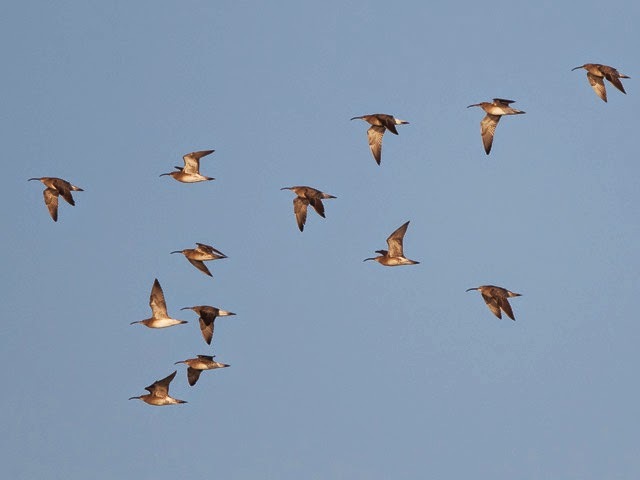 Sea passage was varied rather than spectacular, with the best of the bunch being 10 Black-tailed Godwits and 2 Arctic Skuas off Chesil and another Arctic Skua off the Bill. 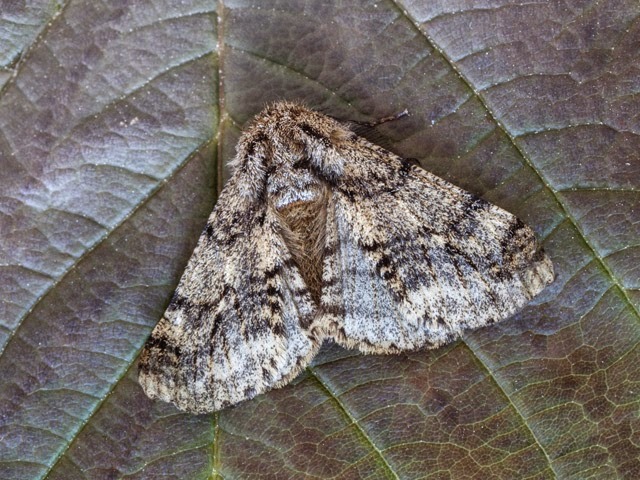 Immigrant moths included 3 Diamond-back Moth and a Silver Y at the Bill and a Dark Sword Grass at Cheyne, whilst a Scorched Carpet was an infrequently caught species from the Sweethill moth-traps. Three Red Admirals passing through at the Bill had the look of newly arrived immigrants, whilst at least 2 Clouded Yellows were at the Bill. The belt of cloud across central Britain that presumably helped in dropping a host of migrants on, for example, the Welsh islands fell a long way short of Portland which was again bathed in constant hot sunshine but certainly not carpeted in new arrivals. 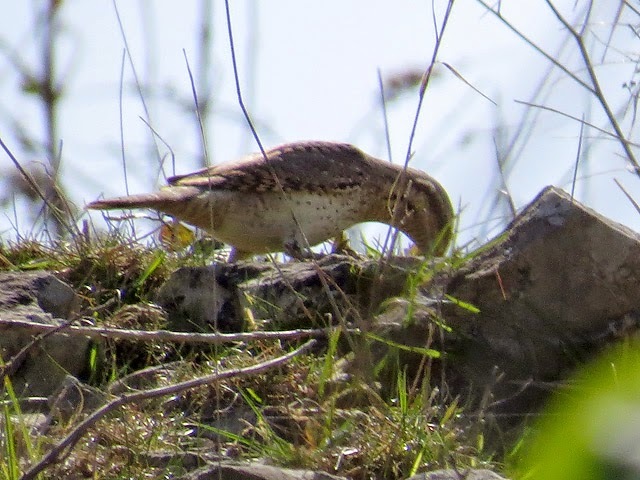 In the circumstances, a Wryneck that showed up at Suckthumb Quarry was an extremely welcome minor rarity, but its back-up cast of less frequent migrants included nothing better than single Ring Ouzels there and at Wakeham, at least 1 new Firecrest at the Bill, a Great Spotted Woodpecker at the Bill and Wakeham, and 3 Redstarts scattered about; the less said about the thinnest possible spread of routine fare the better. 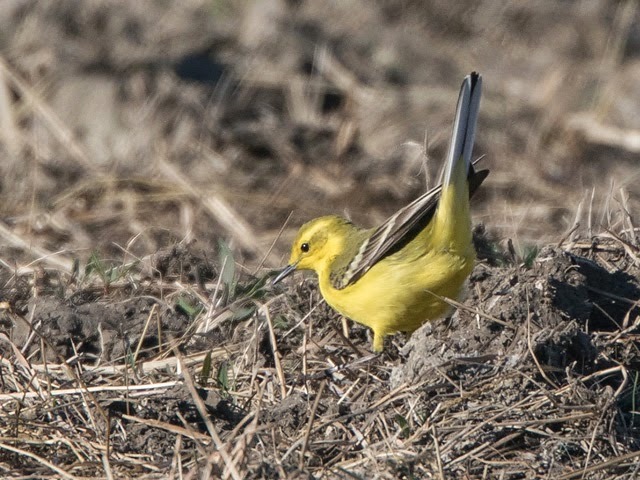 Visible passage was still not the feature that might have been imagined given the conditions, but a few Tree Pipits and Yellow Wagtails did enliven proceedings at the Bill. Ferrybridge and Chesil were busy for a while during the morning, when 123 Common Scoter and 58 Whimbrel passed through off the beach and 27 Whimbrel, 3 Shelducks, 2 Mute Swans, the first 2 Little Terns of the spring and a Mallard dropped in/passed over at Ferrybridge; later in the day single Little Egrets passed through off both the Bill and Chesil. The first Orange-tip butterfly of the year was on the wing at Southwell. Immigrant moth interest consisted of just a single Diamond-back Moth at the Obs. Finally, a nocturnal sounds update to finish off for the day. Nick Hopper's latest offering has been Common Scoter recorded several times in recent nights; of all the recent recordings Nick's passed to us this one just about takes the biscuit, as much for the fact that scoters are flying at night close enough to the Obs to be even heard in the first place as for the fact that the call's utterly unfamiliar (although we tend not to see them particularly close when they're diurnal seawatch flybys, we can't recollect ever having heard any calls from them in any circumstances at Portland) - fantastic stuff! A night of clear skies but fog at ground level didn't bode well for a fall of migrants and it was only the north of the island that picked up any quality in the form of a scatter of 5 Ring Ouzels. For the first time this spring Blackcap was the most numerous of the migrants at the Bill where 50 or more were in evidence; the combined phyllosc tally didn't reach that level, whilst a lowly 6 Wheatears, along with 2 Redstarts and singles of Goldcrest, Firecrest (both very long-stayers that surfaced once again) and Bullfinch made up the rest of a pretty thin spread. 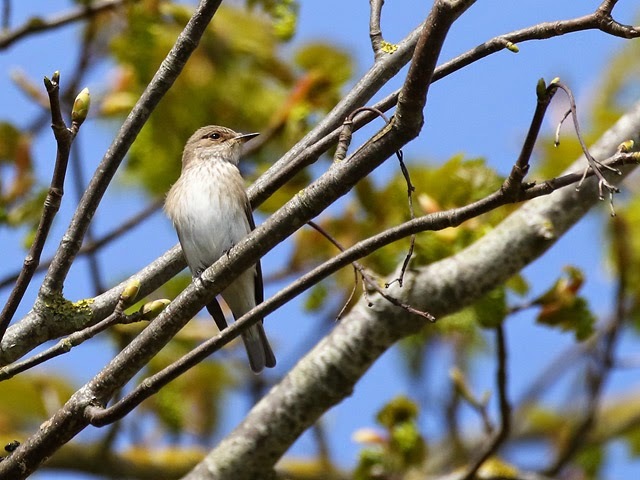 Odds and ends elsewhere included 2 Tree Pipits at High Angle Battery, additional single Redstarts at Verne Common and Nicodemus Knob and a Grasshopper Warbler at Suckthumb Quarry. 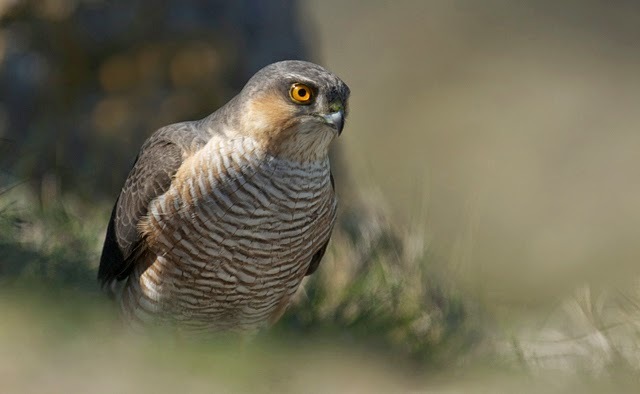 Once the fog lifted it was hoped that visible passage would feature, but in the event hirundines weren't particularly plentiful and passing singles of Kestrel and Sparrowhawk were poor compensation for the lack of larger raptors. 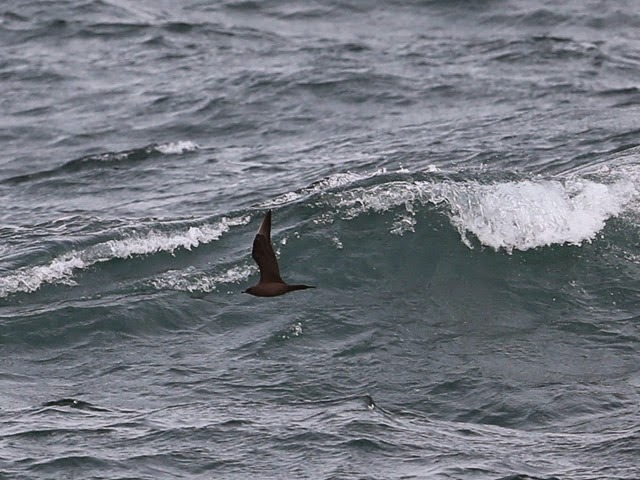 After being invisible for the best part of the morning the sea came up with a little passage during the evening, when the 108 Manx Shearwaters through off the Bill were accompanied by singles of Red-throated Diver and Arctic Skua. 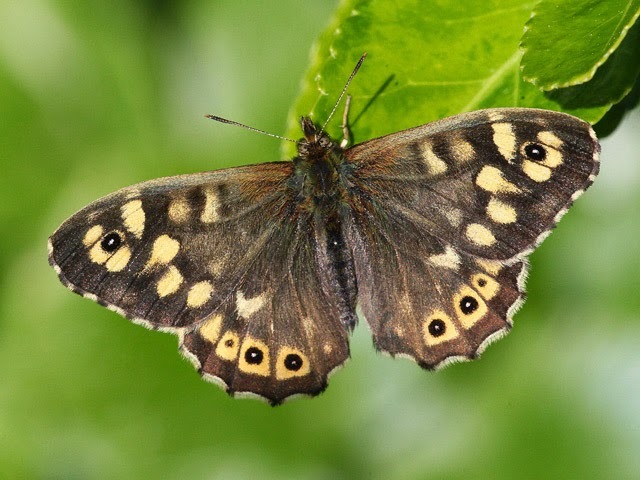 The first Speckled Wood butterfly of the year was on the wing at the Obs. Immigrant Lepidoptera included singles of Hummingbird Hawk-moth and Clouded Yellow at Blacknor and the Bill respectively, and 3 Dark Sword Grass shared between the moth-traps at the Obs and Sweethill. ...in common with several other butterflies and moths at the Obs, this first Speckled Wood of the year was a week or more later appearing on the wing than we've got used to in many recent years. A better day, particularly through the morning when a widespread flurry of migrants coincided with lovely, quiet and increasingly warm conditions; sadly, the latter didn't last and by afternoon a veil of fog had enveloped the Bill area at least. Phylloscs - mostly Willow Warblers today - accounted for the bulk of the numbers, with perhaps as many as 500 about the centre and south of the island; Blackcaps, and to a lesser extent Wheatears, were also well represented but variety was otherwise not really a feature, with 4 Redstarts, 2 Yellow Wagtails and the spring's first Whitethroat the only extras making the tally at the Bill and a late-ish Redwing popping up at Suckthumb Quarry. By late morning passing hirundines had begun to feature in some quantity but the arrival of the shroud of fog put paid to a worthwhile count of both them and other visible migrants. The sea remained the poor relation, with a Puffin off Chesil the day's only oddity. Whilst it was a fair bet that there was a hatful of migration afoot on a nice clear night there were precious few reasons for anything to have to make landfall - and very little did. The migrant tally from the Obs garden mist-nets didn't even manage to get into double figures, let alone include anything of an quality, which was a pretty accurate reflection on the situation everywhere; the season's first Cuckoo did put in an appearance at Avalanche Road, but the only other uncommon migrants on show were single Redstarts at the Bill and the Royal Naval Cemetery. Much like yesterday, only a light movement of 76 Manx Shearwaters salvaged much interest from the sea at the Bill, where 14 Common Scoter, 5 Sandwich Terns and a Red-throated Diver were the only other worthwhile sightings. 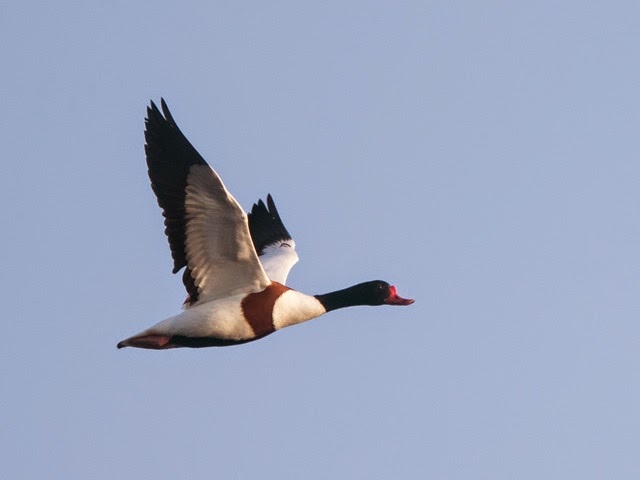 The overnight showery outbreaks than accompanied a passing weather front that introduced fresher, westerly weather did absolutely nothing for the quality of the birding, with migrant numbers taking a right tumble. 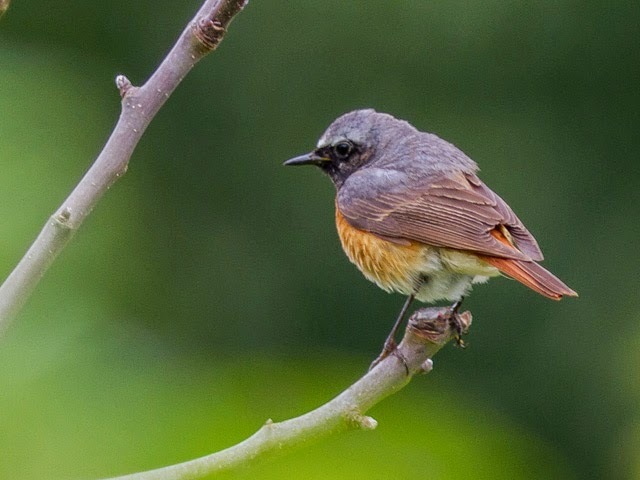 At the Bill there were no more than single figure totals of any of the routine migrants, with a lone Redstart providing the only morsel of interest. 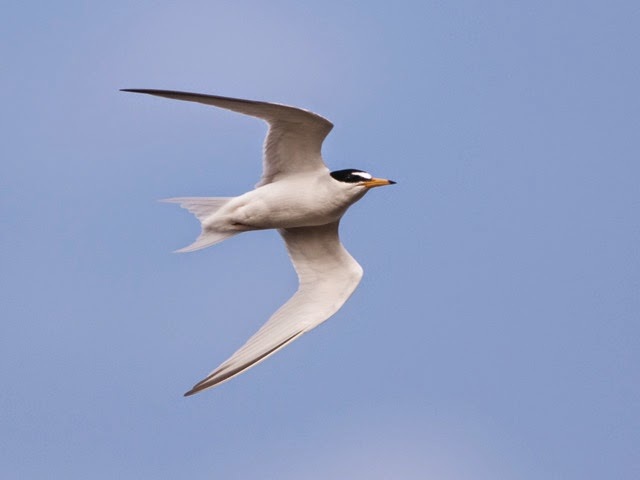 Manx Shearwaters, of which 76 made the log, made up the bulk of numbers off the Bill, where 14 Common Scoter, 5 Sandwich Terns and a Red-throated Diver were the best of the rest. Also an update from Nick Hopper on a couple more nights of nocturnal sound recording. After a night with a fair bit of activity on 5th/6th April Nick drew a complete blank on the night of 6th/7th - the first night during this project that there wasn't a single identifiable call logged! The following night was better with, amongst others, 10 Song Thrushes, a Grey Plover and a Redwing; however, the highlights were the fifth Coot of the week and a Moorhen - the latter calling nicely in the middle of a burst of activity from one of the nearby Little Owls. With the easterly winds and settled conditions of the last week gradually fizzling out migrant interest diminished quite conspicuously today. 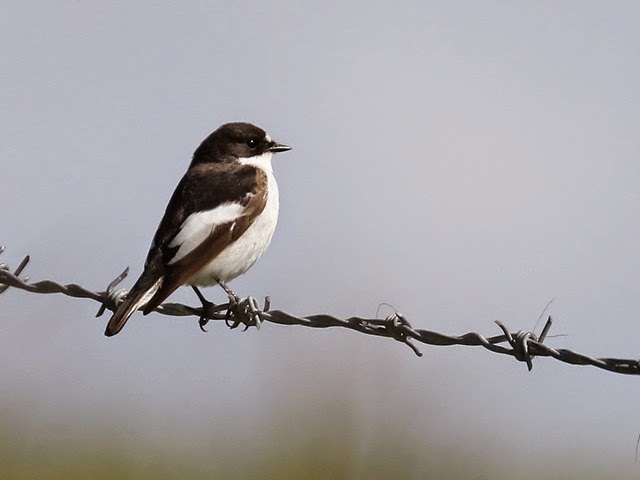 Ring Ouzels still featured, with at least 4 at Verne Common and another single at the Bill, Redstarts numbered at least 10 around the island and a new Black Redstart showed up at the Bill, but commoner fare were only thinly spread on the ground in comparison with recent days. Visible passage included 7 Yellow Wagtails, 5 Tree Pipits and a Kestrel through over sites around the north of the island/Chesil but the likes of hirundines in particular were much less plentiful than might have been expected. To add to the general air of disappointment at what was on offer even the sea didn't come up with the goods in seemingly decent conditions, with Chesil's return of 52 Common Scoter, 27 Common Terns, 20 Brent Geese, 2 Red-throated Divers, 2 Arctic Skuas, a Grey Plover and a Whimbrel far better the Bill's meagre list in reduced visibility. Another single Clouded Yellow was at the Bill where the first Wall Brown of the year was also on the wing. 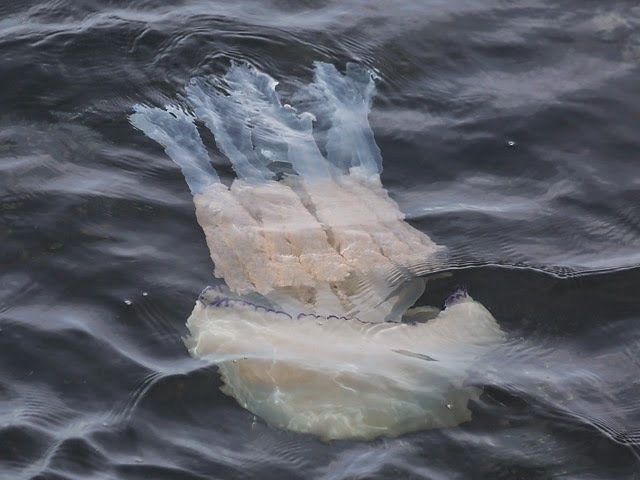 ...for the second year in succession good numbers of large jellyfish are appearing in Portland waters - this impressive specimen was one of a dozen or more off West Cliffs below the auk colony. The combination of the still cold sea and the continuing warm airflow brought forth that all too familiar spring blight of fog today; only the Bill was badly affected but it was more than enough to give a wintery feel to proceedings there even if the birding was well and truly in spring mode. 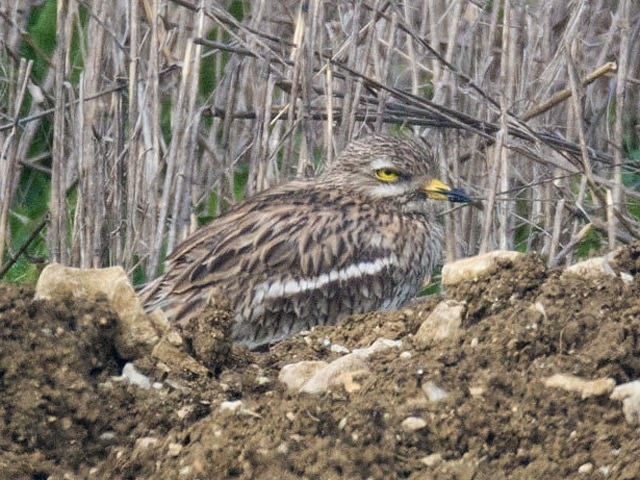 The day's highlight was a Stone Curlew grounded in the Crown Estate Field; other newcomers included first records for the season of Sedge Warbler at the Bill, Pied Flycatcher at the Royal Naval Cemetery and Common Tern through off Chesil and the Bill. 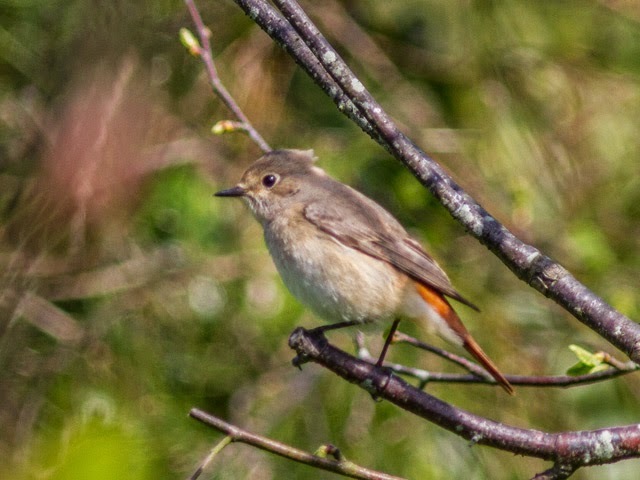 Migrant variety and numbers remained on the up, with a wide scatter of 10 Redstarts, 4 Ring Ouzels and a Short-eared Owl, as well as totals of a good 200 phylloscs and 30 Blackcaps from the Bill alone. The conditions were just right for Chesil seawatching, with 152 Common Scoter, 51 Black-headed Gulls, 38 Common Terns, 11 Whimbrel, 7 Little Gulls and singles of Red-throated Diver, Black-throated Diver, Great Northern Diver and Red-breasted Merganser the reward from a couple of morning watches. Another Clouded Yellow was on the wing today at Kingbarrow Quarry.